When growing orchids, you want to make sure that the flowers last as long as possible. 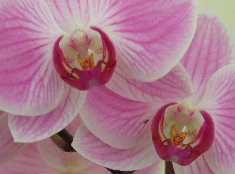 How long your orchid flowers last, greatly depends on the variety of orchid as well as the care that the blooms receive. Phalaenopsis orchids, one of the most popular types, normally bloom 1-2 times a year and the blooms can last anywhere from 60-120 days. Dendrobium and Oncidium orchids have a typical blooming season anywhere from January to March. Both of these types typically bloom 1-2 times a year and their blooms usually last 30-45 days. Another popular type of orchid is Cattleya which will bloom during Spring to Fall once a year normally for a period of 7-12 days, but can sometimes last a little longer. To make your orchid blooms last as long as they possibly can, there are a few things that you should do. The first thing you should do is remember to water your orchid. You don’t want to let the orchid dry out because the flowers need to stay very hydrated. Just remember that overwatering an orchid is not good either. You never want your orchid’s roots to sit in water. The second thing you should do to help keep your orchids blooms is to keep the temperature in your orchids growing area a little on the cool side. Many varieties of orchids typically bloom when the weather is cooler, so keeping the temperature nice and cool will be a favorable environment for your orchid to bloom. Lowering the temperature can actually extend the blooming period by a couple weeks. Something else you should do is be sure to keep pollinating insects away from your orchid. As soon as orchid flowers come in contact with bees or other flying insects, the flowers begin to die almost immediately after being pollinated. To ensure that your blooms will last as long as possible, there are also some things that you want to make sure you do not do. It is important that you do not mist the blooms because if there is too much moisture on the blooms this can lead to orchid disease. Also avoid putting your orchid in an area with too much humidity because this can also create too much moisture. Another place you need to avoid placing an orchid is in a setting with no air circulation. It is important that your orchid gets proper air circulation so that the air doesn’t become stale, because this can also lead to bacteria growth. Something else you don’t want to do is keep your orchid near fruit that is ripening because when fruit ripens it releases ethylene gas which can cause the blooms to die more quickly. Another thing you want to make sure you don’t do is let the orchid get direct sunlight, because this can cause sunburn to the plant. Although, you will need to make sure that your orchid does get the right amount of indirect sunlight such as through a sheer curtain. This indirect sunlight is essential in keeping the blooms vibrant. By following these few simple steps you can ensure that you will be rewarded with blooms. When growing orchids one of the most rewarding feelings, after putting in the time and effort, is getting beautiful blooms that you can enjoy.